Another shop owner, Richard Otekat, 37, has to pay a neighbour hourly to use his generator during blackouts as he can't afford to buy one himself, while others simply go without. 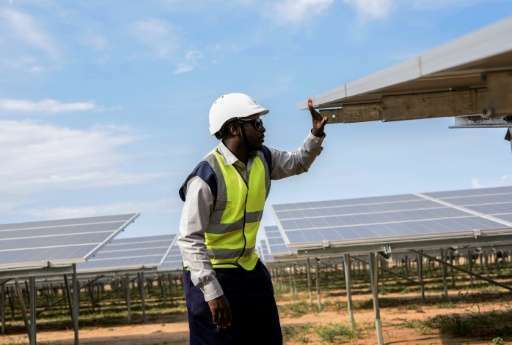 The $19 million (18-million euro), 33-acre solar plant—the first of its kind in East Africa—can produce 10 megawatts of power that is fed into Uganda's national power grid. The project is crucial as Uganda seeks new ways to bring electricity to the 80 percent of its 40 million-strong population that does not have access to power. "We are an agricultural economy, the majority live in rural areas," said Ziria Tibalwa Waako, acting head of the national electricity regulator, Uganda Electricity Regulatory Authority (ERA). It is hoped the introduction of power from the solar plant into the national electricity grid—fed by hydro power and independently run diesel generators—will bring the price down. "Power is costly. It eats into our profit margin," Otekat told AFP. "Unfortunately when power is not there for like six hours that is an automatic loss we are expecting," said fellow shop manager Samsudin, tired of melting ice-cream and meat going off. "The plant will provide clean, low-carbon, sustainable electricity to 40,000 homes, schools and businesses in the area," said Christophe Fleurence, vice president of Eren Renewable Energy, one of two private companies operating the plant, funded by EU partners. He said that Soroti, some 300 kilometres (186 miles) from Kampala, was "where the sun is brighter than anywhere in Uganda." While the solar plant could ensure businessmen like Samsudin and Otekat have a more steady power supply, those who aren't yet connected to the national grid or cannot afford electricity at all, are unlikely to benefit soon. "People use firewood to light their houses because kerosene is very expensive to some households. We had cases of people's homes burnt especially as they slept or when left unattended to," said local official Edward Esegu. Meanwhile, consumers who don't want to wait for the government to provide them with energy often buy small solar panels to power their own homes and businesses. 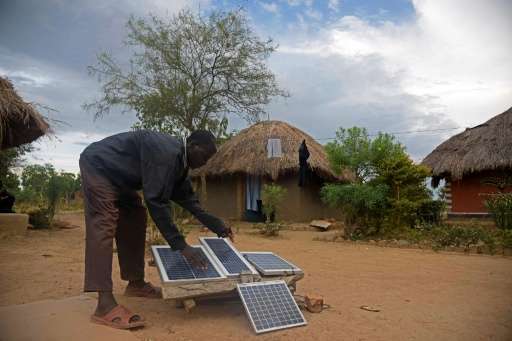 "People walked two or more kilometres to charge phones at a fee but slowly some have bought smaller solar panels," said Esegu. "We recognise that the extension of the grid to the rural poor is not financially viable because of the sparse nature of our population," she said. "It is good. It has come to develop the area," he said. "We are in support of these projects but government has to prioritise the needs of the communities hosting such national projects," said local MP Herbert Ariko. Just as they bypassed the Age of Copper in communications with cell technology, Africa has the opportunity to dodge the Age of Centralized Power with renewables.